Last updated: Jan 5, 2019. 14:47 UTC. With WordPress Comment Spam increasingly becoming an issue, you might find yourself with 100’s or even 1000s of pending comments that you then need to delete. The base WordPress install only lets you “bulk delete” pending comments page by page (i.e. 20 at a time) on it’s default settings. It is not difficult to imagine that this would be very time consuming to do. Before (or after) deleting all your pending comments you may want to consider configuring your WordPress installation to help prevent spam comments. I have created a detailed tutorial for this here. There are a number of ways to delete all the pending comments; some more complex than offers. The easiest method is to change the default settings in WordPress itself to display 200 pending comments at any one time. If you have more than 200 comments, then the next best way is to use a WordPress plugin. I have covered these two options first. If you are comfortable with MYSQL then you may want to follow the later methods, although I do think the plugin method is the easiest way to quickly delete the comments. By default, WordPress only lets you delete 20 pending or spam comments at a time. You can change this setting to up to 200. The first step is to go to the comments management page. In the left-hand menu, click the “Comments” menu item. In the WordPress Admin, go to the 'Comments' page © The Webmaster. In the top right-hand of the screen you will see a link to show the “Screen Options”. Click the link to show the settings. Access the Settings by clicking on 'Screen Options' © The Webmaster. Replace “20” with “200” in the Number of items per page box. Click “Apply” to save the change. Update the pagination to show 200 comments per page © The Webmaster. 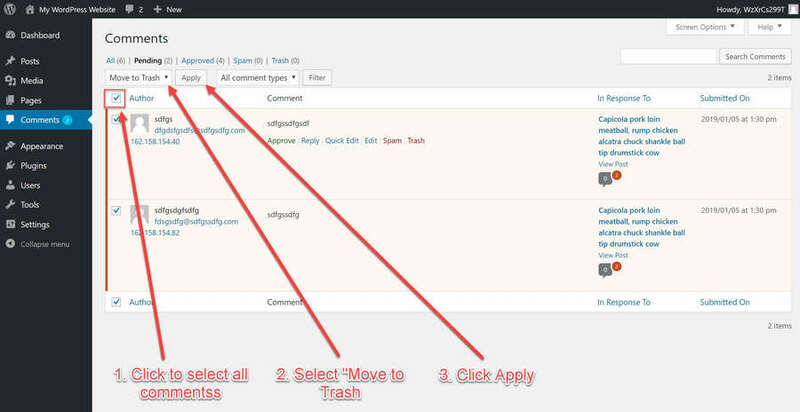 In order to delete pending or spam comments you must first filter the comments. Click “Pending” or “Spam” depending on the comments you wish to delete. Click on 'Pending' or 'Spam' to filter comments by type © The Webmaster. Select all the comments by clicking the box at the top of the first column. Select and Delete the comments © The Webmaster. Using this method only moves the comments to the Trash, rather than delete them permanently. You will need to click on “Trash” and then “Empty Trash” to finalize the deletion. Empty Trash © The Webmaster. Using the Delete All Comments Easily plugin is the least technical and easiest way to delete significant numbers of pending comments in WordPress. 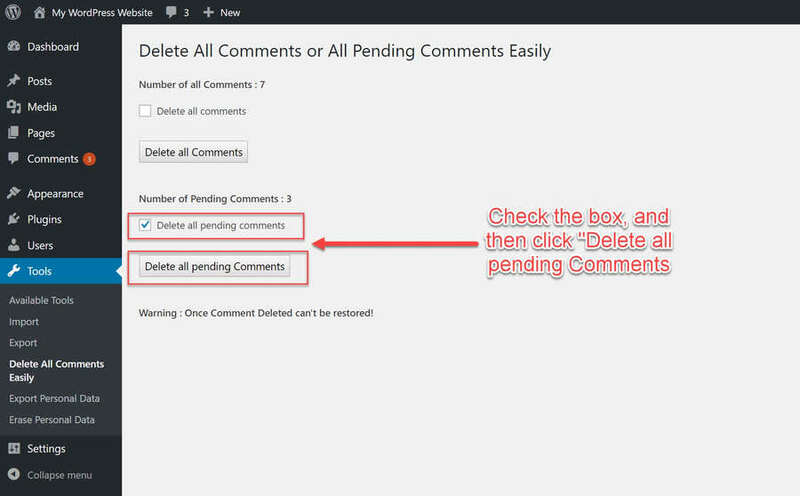 I highly recommend using this method if you have more than 200 pending comments. The first step is to install the plugin from within the WordPress Admin Dashboard. In the left-hand menu, under “Plugins” click “Add New”. In WordPress click 'Add New' under the Plugins menu © The Webmaster. In the top right-hand of the screen you will see a Search Box. Type in the name of the plugin in to the search box. The page will automatically update with the results. Search for the 'Delete All Comments Easily' Plugin © The Webmaster. Install the plugin by clicking on the “Install Now” button. Install the Plugin © The Webmaster. Activate the plugin by clicking on the “Activate” button. Activate the Plugin © The Webmaster. You will find the plugin settings under the “Tools” menu. You will have to click the Tools menu item before the menu is expanded. Navigate to the Plugin Settings © The Webmaster. The final step is to delete the pending comments. You will see the number of comments, and number of pending comments clearly displayed. Check the box next to “Delete all pending comments”, and click the button below. Delete all pending comments © The Webmaster. Log in to your website server via SSH. Many hosts now offer SSH access, but for security reasons you may have to request access. FROM wp_comments WHERE comment_approved = '0';"
Don’t forget to replace your DB_USERNAME, DB_USER_PASSWORD, an YOUR_WORDPRESS_DB_NAME with your sites details. If you used Softaculous or another installer to install WordPress you would have received a confirmation after the install was complete with all the information you will need to run this command. Run the following SQL command © The Webmaster. FROM wp_comments WHERE comment_approved = '1';"
FROM wp_comments WHERE comment_approved = 'spam';"
FROM wp_comments WHERE comment_approved = 'trash';"
Select the Database for your WordPress installation. When you run the command, you will get a pop-up box asking for confirmation. Just click “OK”. Click the SQL tab and run the following command © The Webmaster.